"Knocked Out Loaded" began with a dark but still joyous blues, and traveled through religious expression, anger, loss, humor, fond memories, social declarations, bittersweet recollections, joy, indignant determination and, finally, ending with the most naked expression of human emotion, heartache. It can be argued that *many* albums go in similar directions, but when it comes to Bob Dylan, most things aren't accidental. Even his much-maligned "Self Portrait" and "Down In The Groove" (another underrated work) albums have, in all probability, a grand design and purpose behind them. It just comes down to how willing the listener is to decode whats before them. For all who believe this album was just a bunch of unrelated songs thrown together to create a long player to flog at concerts, that is certainly wrong (Rolling Stain, er, Stone, even said that in their review). When listened to thoughtfully, the portrait Dylan paints of human existence forms a very coherent whole. Just because it's not "in your face" doesn't mean it doesn't come full circle. And he never really promoted "Knocked Out Loaded". I don't believe for a moment that Dylan himself wasn't happy with the album (he really sounds engaged and, as I said earlier, gives perhaps his finest vocal performances ever); but after the all-out publicity push that surrounded his previous album, the great but self-consciously contemporary "Empire Burlesque" (which sadly didn't make it a big seller), he was simply disillusioned with promotion. As for Columbia, they didn't do a whole lot to make the public aware of "Knocked Out Loaded"; they never even commissioned a video to promote the album, and this was at the height of video influence in the music industry. Exactly why, I don't know. 'Got My Mind Made Up' was not the best pick for a single, either - 'Driftin' Too Far From Shore' would have been a much better choice. Columbia really dropped the ball with this project, an indignity for such an important work from their premiere talent. The cover is drawn by Charles Sappington, depicting a scene from a Gregory Peck western, "Duel In The Sun". The art is perfect as the album definitely has a western atmosphere throughout, not even considering the Peck reference (regarding a different film) in 'Brownsville Girl'. 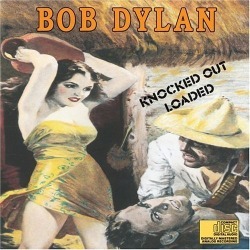 No other album recorded by Bob Dylan (or, for that matter, anybody) comes anywhere near the feel of "Knocked Out Loaded". It is undeniably unique with it's blend of several genres, styles and writers. It may seem like heresy for any Dylan fan to say this about any album that doesn't contain all-original compositions, but I'm brave...I consider "Knocked Out Loaded" to not only be a fascinating work, but a truly brilliant one. Of course, that means nothing to anyone but me, but I suspect there are others out there who may agree. Or not; tell me where I'm right or wrong. Drop a line in the guestbook or email, I'll get back to you and will ask permission to publish your insights in reader comments. But most importantly, if "Knocked Out Loaded" gathers dust in your library, pull it out and listen again. There are many albums I didn't like for one reason or another and years later found my opinions had changed drastically ("From Elvis Presley Blvd." being a big one) - and vice versa ("Give My Regards To Broad Street" being an example of this reversal). And if you don't have "Knocked Out Loaded", by all means get it. It isn't a typical one to find at stores (especially in light of it's apparently being deleted) so I have links to visit and do an online purchase. There's also links to other Bob sites for further information and other opinions relevant to this page. Let the final word on "Knocked Out Loaded" also be the final line on the album. It sums the album up perfectly with it's mix of pathos and humor. Baby, two feet from the well."